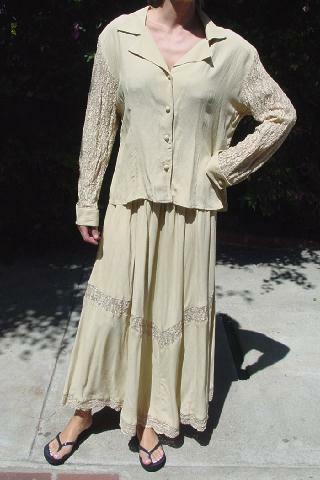 This vintage (late 1980s) 100% rayon two-piece outfit is a Marsha Brander For Componix. It's in a honey-wheat color with gold lace. The skirt has a 2" wide elastic waistband, and it has a 1 3/4" wide lace see-through V shaped accent in the front and back. The bottom hem has a 1 3/4" wide lace panel. The surface has a thin line crinkle surface. The blouse has shoulder pads and long sleeves with 2" wide cuffs which have double fabric covered buttons on each. There are four buttons down the front, and the long sleeves and back are lace. The blouse can be worn out with or without a belt, or tucked inside the skirt. The skirt has a tiny gray color spot 8" inward from the left side seam and 3" upward from the lace V.
Because the skirt is full, we don't think it's that noticeable. 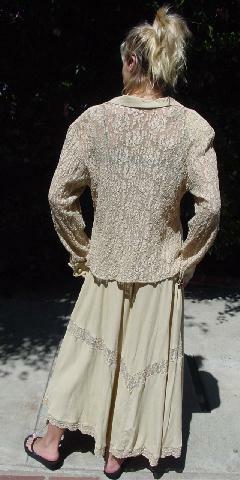 waist to bottom lace 36"